I just finished reading an online article on our industry. It made no sense to me so I read it again. It didn’t help. I was still left with a strangely familiar, yet somehow very uncomfortable feeling I’ve come to expect when I’m confronted with two conflicting realities fighting for the same small piece of real estate in my head. Psychiatrists, psychologists and social scientists generally refer to this phenomenon as “Cognitive Dissonance.” If you wanted to translate that into English, conflicting ideas used to describe or explain the same concept or event would be a good start. We could steal a few lines from an old George Carlin routine to help explain Cognitive Dissonance, like: Jumbo Shrimp or Military Intelligence, but I’m not sure we have to. There are plenty of examples in our industry to draw from that are equally as provocative, but far less amusing. For instance, using Good and Cheap to describe automotive service comes to mind almost immediately. But, it is just as applicable when you try to apply Good and Cheap to Aftermarket parts or any other parts for that matter. Fast and Good is another example of Cognitive Dissonance. What kind of experience have you had with Fast and Good when talking about the same event? They are almost mutually exclusive, aren’t they? 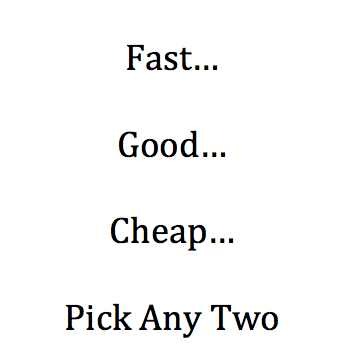 When it comes to Fast, Good and Cheap, it almost seems as if you can have any two you choose… You just can’t have all three! You can have Fast and Good – we do it every day. But, it won’t be Cheap. You can have Fast and Cheap, but it isn’t likely to be Good. You can even have Fast and Cheap… But, what are the chances of Fast and Cheap turning out to be Good? What about Fast and Good? Sure… we’ll put two of our best Techs on it: but, Cheap? I don’t think so. And, that was the problem with what I’d just read. 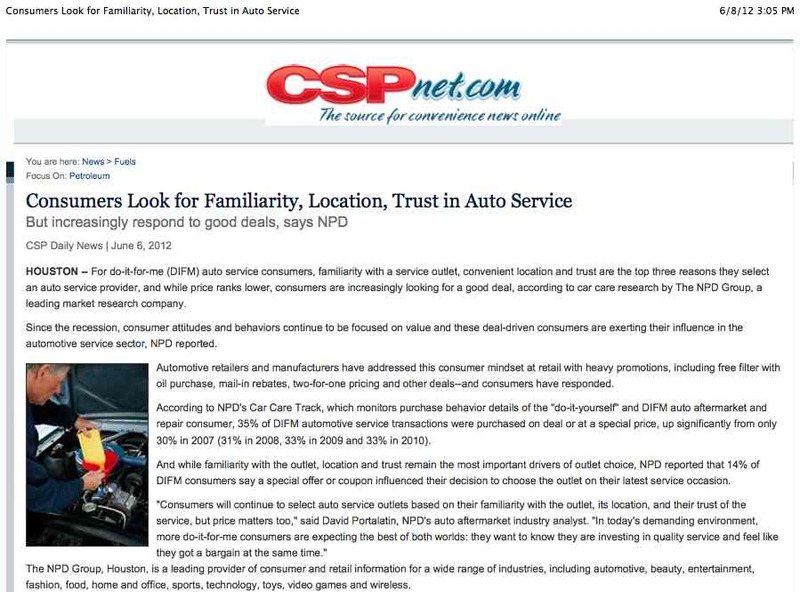 It suggested that while today’s Do-It-For-Me consumers are still searching for a relationship: for familiarity, trust and convenience, when it comes to their automotive service needs, they are still looking for a “great deal” to take that transaction way beyond it being just a good value. The problem is the reality of the marketplace. The problem is an industry that never got the memo and as a result missed the lecture on Business Management and Best Practices: an industry in which a room full of independent repair shop owners is more likely to produce an Average Net Operating Profit of between -2.5% to +2.5% than not! It makes perfect sense and yet it makes no sense at all: Cognitive Dissonance, all over again! More consumers want bigger discounts or better deals – up to 35% of the DIY or DIFM purchases of automotive services or products were purchased at a below retail price according to the article I , so if you want more consumers it just stands to reason that you would have to offer more of whatever it is you are willing or able to offer. The problem is, at 2.5% NOP, anything you give away is too much! The problem is a repair community that has been subsidizing automotive service for the better part of a hundred years with unrealistically low pricing for both parts and labor because most shop owners haven’t got a clue what it costs them to open their doors every morning. And, because Charlie, across the street, is giving away his family’s future by discounting and unrealistic pricing, you may find yourself drawn into that vortex of high volume, low profit repair orders. The problem is you can’t purchase a profit… You can’t read an article like this and decide the only way to succeed in a future that demands bigger discounts and lower prices is to get along by going along: to either purchase cheaper, lower quality parts and/or put extraordinary pressure on your suppliers to emasculate their margins on quality parts so you can pass those savings along to an ever more insatiable motoring public. When those savings are passed along everyone loses! The only one with any chance of winning is the vehicle owner and only then, when he or she is purchasing a quality part at bargain prices. You can’t purchase a profit any more than you can put Good, Fast and Cheap in the same basket. It just won’t work. So, my best advice is don’t try! Continue to search for clients that are still interested in quality work, done right the first time, finished on time and at a fair price. Continue to move your business toward Best Practices and the profits that will almost certainly follow. And, if you still want to give some of your hard earned money away, make sure it’s some of the money that’s left over after you’ve become profitable and achieved a 25% NOP, not the money you need to survive when that NOP is just 2.5%.